Inder Loves Folk Art: More pink stuff. I've accepted it (for now): Maggie will only wear pink. It isn't my choice, but sewing pink clothes that I like too is actually turning out to be a pretty fun challenge for me. So the pink Oliver + s wardrobe continues! This time I decided to go with some practical school clothes. 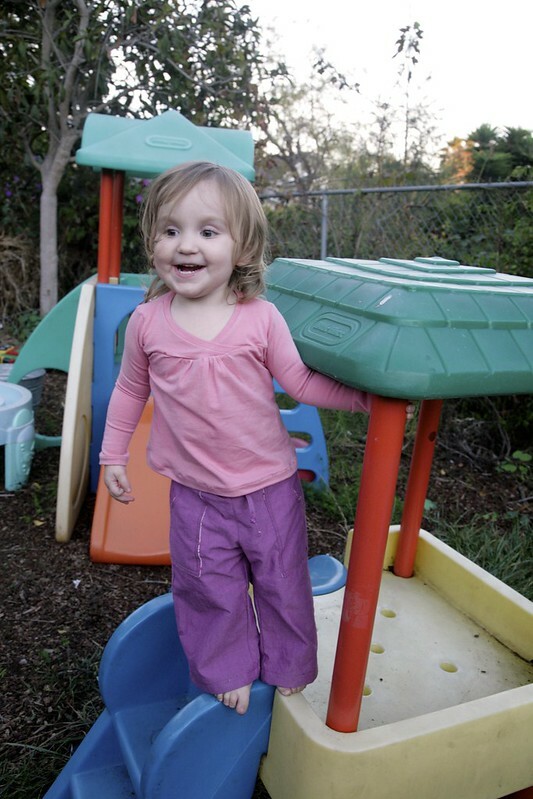 Maggie may love pink, but baby girl is also active as can be and wears pants and t-shirts to school most days. See what I mean? She's a monkey. 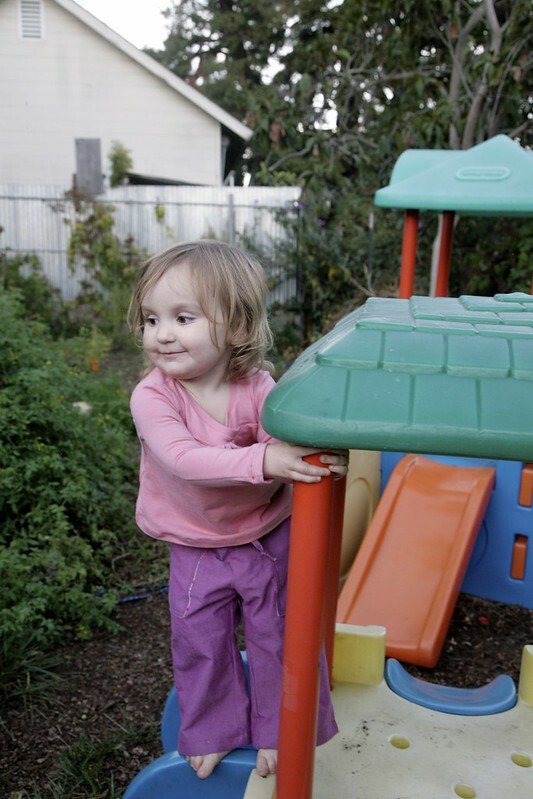 Pattern(s): Oliver + s Sandbox Pants and Hopscotch Top. Fabric: The pants are made from Kaufman Interweave Chambray in "Sorbet" with some pink floral scraps used for the pocket linings. The top is a nice quality lycra cotton I bought ages ago and can't remember the provenance of. First time? Nope! I made the Hopscotch top for Maggie when she was a baby. I've made the Sandbox pants for Joe twice, once in denim and once in linen. I love me some patch pockets. Size: 18-24 months. I modified the pants to fit a bit better, so they are not sewn as drafted. They would have been way too big/fit weirdly (see below) otherwise. Modifications: None whatsoever to the top, but a few to the pants. So, I'm going to come out and say this: I think that there is a drafting mistake on the Sandbox pants. The rise is so long, it's ridiculous. You either have to pull them up to your poor child's armpits, or the crotch hangs super low. With both of those pairs I made for Joe, I ended up going back and redoing the waistband to shorten the rise. Now on my third pair, I was prepared for this, and just lopped a full inch off of the top of the pants where the waistband attaches. Adjusting the pockets isn't necessary (they are still useable even with an inch cut off the top - another reason to think this must be a mistake!) but I moved them down a half inch just in case. Even with this change, the rise is on the long side in my opinion. I did use narrower hems on the pants to offset the loss in length from the top. It's funny, I've had this issue with every pair of these pants I've made, in different sizes. I know it's practically blasphemy to say this about Oliver + s, but I am pretty much convinced this is a drafting mistake and not a fitting preference. I'm surprised I haven't seen anyone else mention it in posts about these pants, but to be fair, this was a very early pattern for Oliver + s and they've come a long ways since. Man, I have cute kids. And they really love each other. The Good: Practical separates for Maggie! Yay! It was fun to whip up two relatively easy and fast (and familiar) Oliver + s patterns. Maggie needed more pants and long-sleeved tops for the autumn, and these fit the bill. Chambray is a bit light for really cold weather, but given Maggie's generally slow rate of growth, these pants will likely still fit next Spring, or I can cut them off and make them shorts in the summer. Okay, Joe, that's a bit TOO much love. The Not-So-Good: Frankly, these are not my best work. Maybe it was the pink, or maybe it was the basic, practical shapes, but my heart wasn't really in it when I was sewing these. My topstitching is fair to middling on the Sandbox pants. Meh. Fine, but nothing to be proud of. And I whipped the top up on the serger, which turned out to be a mistake. Never try to attach a cross over bodice to a gathered skirt piece on a serger without basting it all together first. Just don't do it. What was I thinking? So yeah, I had to redo that seam like four times, each time shaving off a bit more fabric, and ... it turned out okay, but I'm not proud of it. Then it turned out I had no matching thread for the hems, and I zig-zagged them rather than using double needle so the zig-zag is kind of obvious and a little wavy too boot... whatever, it's fine. She'll get a ton of wear out of it. But I should make this top again and try actually paying attention! 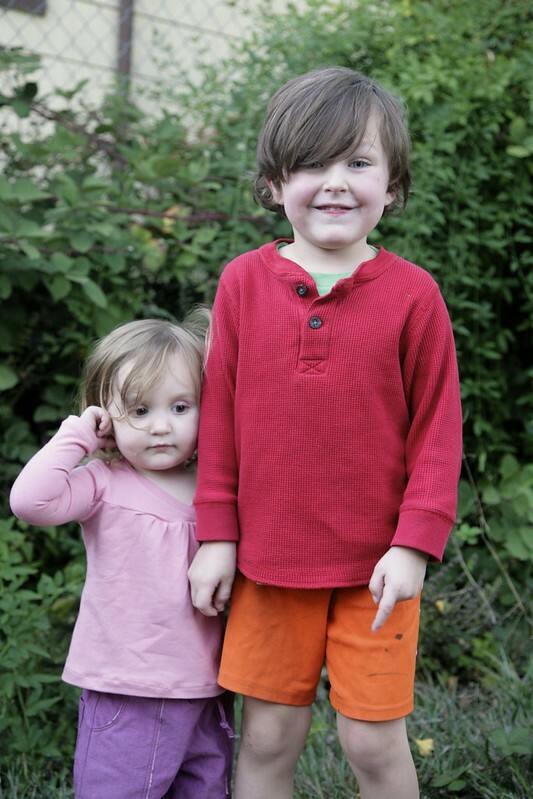 This photo really shows how TINY Maggie is compared to her big brother! Make again? Oh, totally! For all my complaints, I really love the beachy, relaxed vibe of the Sandbox pants. I am hoping that one day Joe will decide to wear (a) woven fabrics; and (b) pants again, and I can make another pair for him. And I know I could do a better job on the Hopscotch top/dress if I just put my mind to it! Kids can never have enough knit tops. And now I think I need to take a break from Maggie sewing, and possibly make something for myself ... ? So, my Oliver + s peeps: Tell me honestly, do you think the rise on the Sandbox pants is freakishly too long? It's not just you - I thought the same about the rise. I may just re-visit this pattern and use your lop an inch off the top method. They are definitely adorable! 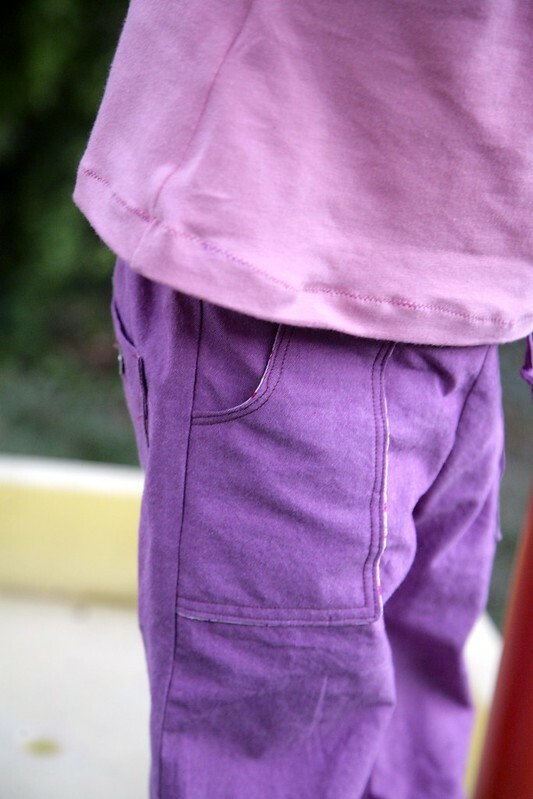 I've only sewn the larger size range of the Sandbox pants and didn't have any issues with the rise. Perhaps it's only the smaller size range? The outfit is cute! I hear you on sewing up clothes in colors that you are not personally fond of...but we'll do anything to keep our kids happy with mama sewn clothes! Very cute on her and welcome to the pink stage!! Sarah is just finally getting out of hers. ;-) When we are finally able to get to our clothes in storage I have lots and lots of pink clothes for her!! I have the same fit problem with the rise on these with Sarah but not any of the boys so maybe it's a boy/girl fitting issue. I think hers needed to come down an 1 1/2". 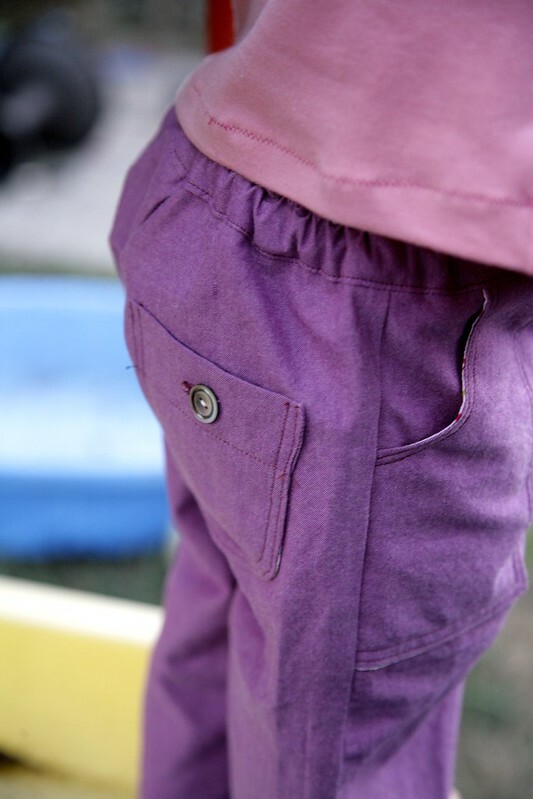 I've never sewn the Sandbox pants but by the sounds of things, you're right. An inch is a lot to need to remove on pants for someone so small! Love the photos. 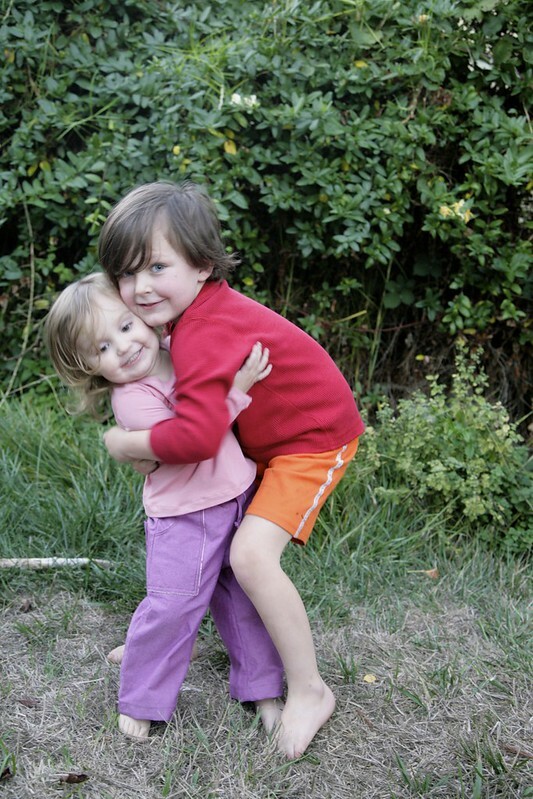 Seeing siblings loving each other is THE BEST THING. But hey, where did Joe's curls go? Ha! I just made Sandbox pants for the first time last week (for my 4yo girl), and followed your own very good advice to use the crotch curve from the Sketchbook shorts! Fwiw, that also ends up taking about an inch off the top of the rise. Oh I think they are adorable! I think it's funny when little ones get so opinionated on their wardrobe. And at such an early age. I was wondering if Joe was wearing pants yet...one day!! Hey Inder! I thought for sure I had commented on this! I actually made this pants for little Jude here: http://www.stitched-together.com/search?q=pants+airplane and I did not notice them being high in the rise at all. So I am wondering if what others are saying is true - that perhaps there was a drafting error in the smaller sizes? I think that was the case with the O+S puppet show shorts but in reverse. Do you remember the problem I had with those? 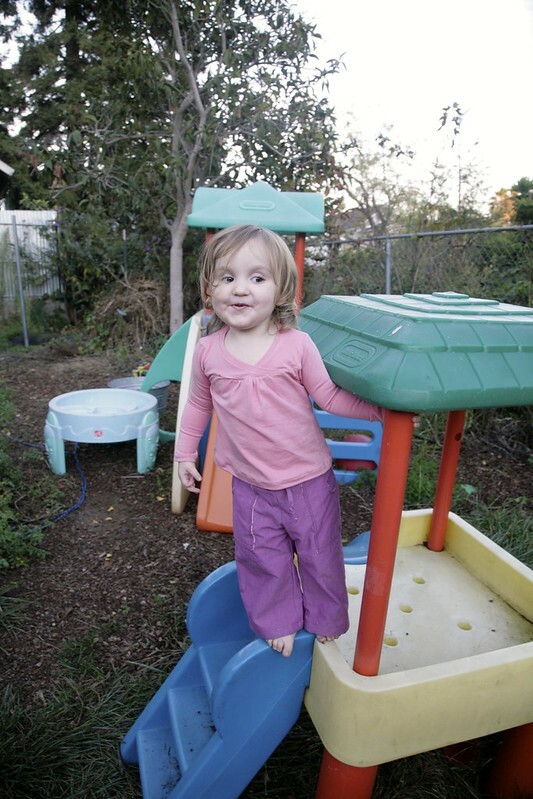 Your kids are darling and little Maggie looks adorable in her mama mades. Well your pink things sure are cute! The pink tshirt fabric looks so soft and those pockets are all quite fun! 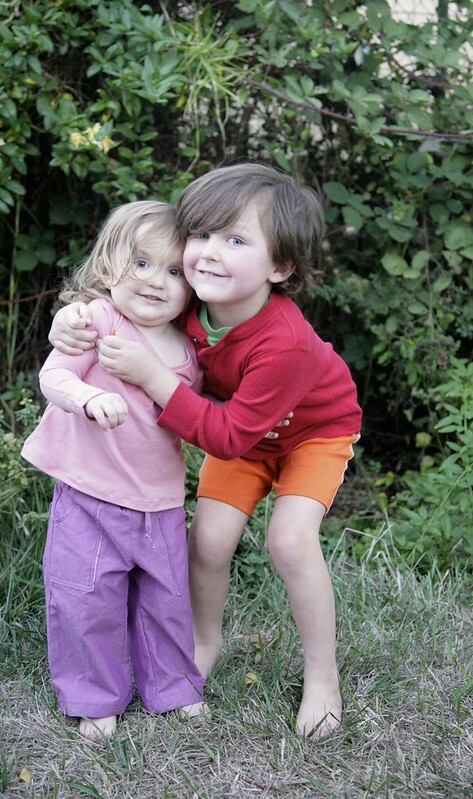 And this is a timely post for me as I just traced the pants pattern for my kids. I may compare them to some otter pants before cutting- so thanks for heads up! Love those pants! And Maggie's little mischievous expression! Oh, the pink phase. At least by sewing you can avoid pink with Disney images! I've only made the size 5 Sandbox and no concerns about the rise. They are a lower crotch than some other pants but not MC Hammer territory. I actually noticed recently how perfect they are for cycle commuting to school as the slightly longer rise leaves the lower back well covered. Plumbers take note! At least you've found a good solution, cause Maggie's pants are cute! This is adorable! Z loves pink too... what can you do? There are ways of doing pink that aren't so PINK, and this totally fits the bill.